following the establishment of the village. On 27th August 1989 a public meeting was held in the St Joseph's Catholic Church Hall in Morrinsville to try and put a committee together who would be willing to build a retirement village in Morrinsville. The group was made up of mainly Dutch people, but their desire was to build a village that was open to all nationalities. A committee was established under the presidency of Jim van Hellemond. The committee found a 5.6 hectare site on the corner of Thames Street and Seales Road and then proceeded to secure interest free loans to raise the funds needed to purchase the site. 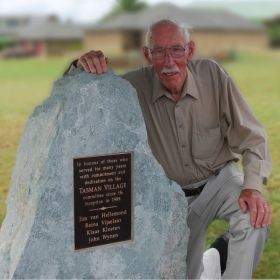 The Tasman Village committee got underway with the planning by acquiring the services of an architect and surveyor. Money was very tight, especially in the early years, but the committee was blessed with many capable volunteers who gave of their time to do fencing, plant gardens and prepare lawns - tens of thousands of dollars were saved in this way. Slowly homes began to be built - they were well designed with a lot of thought being given to insulation and effective heating, and in 1991 an award was won for the energy efficiency of the homes. Early on it became clear that with the rate the village was growing that a community hall would be needed but the funds wouldn't allow this to be built until considerably more sites were sold. The village once again rallied together to raise the funds to purchase a temporary hall and had it moved onto the site, and then the residents worked together to make the hall into a nice recreation centre where people could meet and socialise. The hall has continued to be well utilised over the years and the residents eagerly anticipate the day when the permanent hall will be built. The village has continued to grow and develop with more stages being developed and new houses being built. What began as bare farmland has now been transformed into a beautiful village where new residents can quickly feel at home and enjoy the companionship of others in the same stage of life.